Massive Warfare: Aftermath is a brand new action-packed fighting game for mobile devices. It features multiplayer online PvP mode in which your objective is to shoot down enemy vehicles and top the leaderboard. But it would not be easy! In this post, we have covered everything about the game you need to know; Massive Warfare Aftermath cheats, tips, and the strategy guide to top the leaderboard and rank up fast to get more rewards. 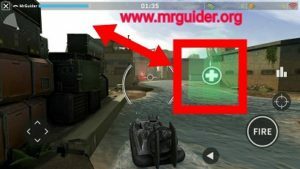 As usual, it starts with a tutorial in which you learn about the basic of the game; how to play Massive Warfare Aftermath game, about controls, how to control tank, how to shoot, and much more. The tutorial also guides you through the upgrading system. The very first step you have to do in Massive Warfare Aftermath game is choosing a vehicle; you have three options to choose from; helicopter, tank, and hovercraft. Choose wisely because later you will have to pay gold to get another one. 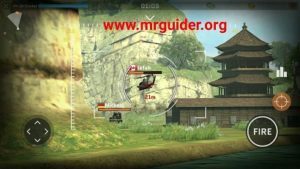 I would recommend you to choose either helicopter or hovercraft because movement speed of these vehicles is better than tank and speed of the vehicle matters a lot in the battle. In this part, we will learn about the vehicles, what are the best vehicles, about upgrades, tech, stickers, how to unlock new vehicles, and much more. Among all these attributes, the movement attribute is very important. Because, if the speed of a vehicle is fast, then you can easily dodge enemy attacks. On the other hand, if the speed of a vehicle is slow, then enemies can easily target you and it would be difficult for you to get out of the enemy range because of slow speed. So, choose the vehicle with fast speed. 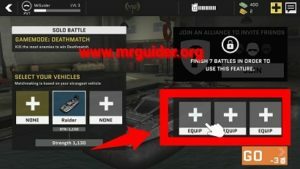 How to unlock new vehicles in Massive Warfare Aftermath game? You can check all the unlocked vehicles in the vehicle tab. To unlock the new vehicles, you need to rank-up. How to rank-up? Get victories in the battles and earn ranking points. After reaching the threshold, you will be promoted to the next league. Before you start the battle, you can choose the tech. Tech is like “add-ons”. These tech items benefit you in a number of ways. For instance, Repair Kit item can instantly repair 50 % of the vehicle’s health. Shield item protects you for 10 seconds in the battle. How to get tech items in Massive Warfare Aftermath game? You can get these items from the crates/chests. Get victories in the battles or top the leaderboard in a match to obtain the crate or chest. You can also purchase chest in exchange for gold in the shop or directly purchase the tech items in exchange for cash. Camouflages and stickers are another in-game items or upgrades used to increase the strength of your vehicle. Tap on the paint tab -> choose an item and confirm. To get these items, you need gold. You can earn gold for free, just read out our Massive Warfare Aftermath cheats, tips below. In short, these items can increase the vehicle attributes; attack or armor. At the beginning of the game, the alliance mode is locked. Complete the certain number of battles to unlock this mode. You need EXP(Experience Points) to level-up. One of the best ways to level up fast is by shooting down the enemy vehicles as many as you can. Get the victories in battles and gather EXP. Your main objective is to shoot down the enemy vehicles. The more you kill, the better will be the reward. At the top-left of the screen, there is mini-map, keep an eye on this map to track nearby enemies. And you can check your health status near the mini-map. Once you lose all HP[Health Points], respawn and go back to the battlefield to destroy enemy tanks or helicopter. At the bottom-left side, use the joystick to control navigate your vehicle or hold down your thumb on the right side of the screen to change the camera view or to aim manually. At the right side of the screen, there are combat options; fire button, zoom-in or if you have equipped a booster, then you will see the icon there. So, this is the Massive Warfare Aftermath beginner’s guide. Now, let’s start the cheats, tips, and strategy to top the leaderboard, get free gold. By default, auto-aim is turned on. It means, your vehicle will target the enemies automatically, you just have to tap on the fire button. But, auto-aim is not too great, it would be better to turn it off and target the enemy vehicle manually. Go to the main screen – tap on the menu(tap on the hamburger icon at the top-left of the screen) – settings – control – uncheck the box next to auto-aim option. It would be great if you target a specific vehicle. Look at the top-left side of the screen, there is a mini-map. Keep an eye on it to track your enemies. Don’t go where there are more than one or two vehicles. Start moving in that direction where there is a single vehicle or target a specific vehicle at a time. You can use the zoom-in feature to fire accurately. Since you can not fire an unlimited number of shots at a time and reloading takes time, it would be better to fire accurately using the zoom-in feature. If you fire at the critical part of the vehicle(for instance, the back-end of the helicopter), you can deal more damage(critical hit). On the battlefield, you could get the boosters, for instance, a healing booster can restore the vehicle’s health, using the speed-up booster, you can increase the speed of the vehicle, use a damage-up booster to deal more damage, and there are so many on the battlefield. For instance, if the vehicle’s health points are low, the find “heal”(+sign, green color) point and restore HP instantly. And after you shoot down the enemy, don’t forget to pick-up the cash. To improve the vehicle stats; speed, fire rate, attack, and armor, upgrade it using cash. You earn cash by defeating the enemies in the battles or after the match, on the basis of your performance. Keep upgrading and keep improving. Watch the video ad, join the alliance, and tap on the menu -> at the bottom-left of the menu, tap on the FB icon to obtain free gold. Don’t waste your gold in instant upgrades. Use it to buy stickers or Camouflages.